Having candles always creates great ambiance, the mood is set especially if you are looking for a romantic mood. Candles and water always attracts the eye, it produces a pleasing effect that is calming and uplifting. What are floating candles? They are candles that literally float on water, as they are not fixed they have a movement that provides interest. These kinds of candles are available in lots of different colors, shapes and sizes. A water candle display makes a great centerpiece. These displays attract attention for some the different floating shapes are more interesting than the bowl used to hold them. 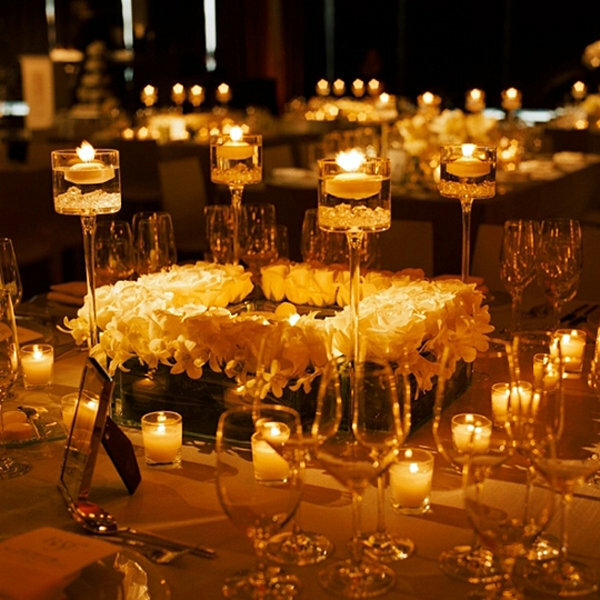 To create a stunning centerpiece with floating candles find a container that satisfies your theme or decor. Any container with a wide open top that holds water will be fine. The best type of bowl is usually glass, this is so the candles are apparent and the reflections clear to see. To get some lovely reflections consider using a crystal bowl or perhaps a polished metal one. If the floating candle holders are to be placed lower than eye level say on the ground then a solid bowl such as pottery or wood can work well also. Next you need to choose the color and style of the candles to go in the bowl. Floating candles come in all kinds of shapes and colors, so choose something that looks good with your bowl, or that you really like. Then to set up the display, add some water to the bowl, add some flowers in a contrasting color and place the candles in amongst the flowers- the flowers should just be enough to break the candles up and stop them clumping together. To make the floating candle centerpieces really impressive, surround the bowl with more flowers or leaves. Water candles are generally small like flattened balls with a short wick; their bottoms are often rounded to help them float. The small size (2 or 3 inches around) means that use a number of them at any one time and to create the best effect. Candles come in all sorts of shapes from many kinds of flowers including poppies, lilies, roses and pansies to ornamental shapes like butterflies, turtles and fruit. Star floating candles are very popular around Independence Day. It is also possible to get large floating candles for use on pools; sometimes they have more than one wick. The most popular color for these candles is white; the lighter shades show up much clearer against the water. You can choose scented candles to add more ambiances to your mood or party, great for a wedding. There are a number of scents available usually in normal floral room fragrances like cinnamon, pine, ginger and of course rose floating candles. There are also some fruit scents. Using candles outside on larger bodies of water can create ambiance for special occasions. 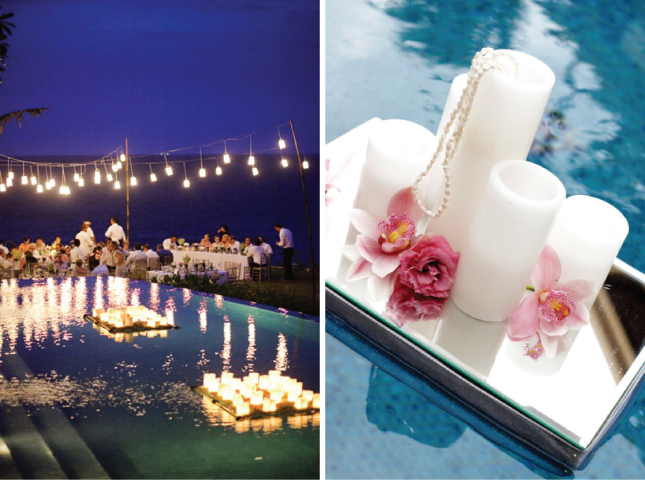 Candles on pools or ponds add a magical effect and are very mood setting. Pool candles tend to be larger than tabletop candles, usually 5inches across, and can come in round or novelty shaped such as butterflies or small animals. Some lighting effects for the pool look like candles but are flameless candles, these can still be effective. To use real candles as well as floating ones, it is possible to get floating candle holders for example in the shape or water lilies. These holders will take a tea light candle and can be used repeatedly. Some of these holders come in novelty shapes for themed parties such as the rubber ducky to go on a spa.